Zena "Chief Z" Williams, unofficial mascot of the Washington Redskins, signs autographs during fan appreciation day at the Redskins' NFL football training camp at Redskins Park in Ashburn, Va. The name Washington Redskins has inspired protests, hearings, editorials, lawsuits, letters from Congress, even a presidential nudge. Yet behind the headlines, it's unclear how many Native Americans think "Redskins" is a racial slur. The name of a certain pro football team in Washington, D.C., has inspired protests, hearings, editorials, lawsuits, letters from Congress, even a presidential nudge. Yet behind the headlines, it's unclear how many Native Americans think "Redskins" is a racial slur. Perhaps this uncertainty shouldn't matter - because the word has an undeniably racist history, or because the team says it uses the word with respect, or because in a truly decent society, some would argue, what hurts a few should be avoided by all. But the thoughts and beliefs of native people are the basis of the debate over changing the team name. And looking across the breadth of Indian Country - with 2 million Indians enrolled in 566 federally recognized tribes, plus another 3.2 million who tell the Census they are Indian - it's difficult to tell how many are opposed to the name. The controversy has peaked in the last few days. President Barack Obama said Saturday he would consider getting rid of the name if he owned the team, and the NFL took the unprecedented step Monday of promising to meet with the Oneida Indian Nation, which is waging a national ad campaign against the league. There are Native American schools that call their teams Redskins. The term is used affectionately by some natives, similar to the way the N-word is used by some African-Americans. In the only recent poll to ask native people about the subject, 90 percent of respondents did not consider the term offensive, although many question the cultural credentials of the respondents. All of which underscores the oft-overlooked diversity within Indian Country. "Marginalized communities are too often treated monolithically," said Carter Meland, a professor of American Indian Studies at the University of Minnesota. "Stories on the mascot issue always end up exploring whether it is right or it is wrong, respectful or disrespectful," said Meland, an Ojibwe Indian. He believes Indian mascots are disrespectful, but said: "It would be interesting to get a sense of the diversity of opinion within a native community." Tommy Yazzie, superintendent of the Red Mesa school district on the Navajo Nation reservation, grew up when Navajo children were forced into boarding schools to disconnect them from their culture. Some were punished for speaking their native language. Today, he sees environmental issues as the biggest threat to his people. The high school football team in his district is the Red Mesa Redskins. "We just don't think that (name) is an issue," Yazzie said. "There are more important things like busing our kids to school, the water settlement, the land quality, the air that surrounds us. Those are issues we can take sides on." "Society, they think it's more derogatory because of the recent discussions," Yazzie said. "In its pure form, a lot of Native American men, you go into the sweat lodge with what you've got -- your skin. I don't see it as derogatory." Neither does Eunice Davidson, a Dakota Sioux who lives on the Spirit Lake reservation in North Dakota. "It more or less shows that they approve of our history," she said. North Dakota was the scene of a similar controversy over the state university's Fighting Sioux nickname. It was decisively scrapped in a 2012 statewide vote -- after the Spirit Lake reservation voted in 2010 to keep it. Davidson said that if she could speak to Dan Snyder, the Washington team owner who has vowed never to change the name, "I would say I stand with him . we don't want our history to be forgotten." In 2004, the National Annenberg Election Survey asked 768 people who identified themselves as Indian whether they found the name "Washington Redskins" offensive. Almost 90 percent said it did not bother them. But the Indian activist Suzan Shown Harjo, who has filed a lawsuit seeking to strip the "Redskins" trademark from the football team, said the poll neglected to ask some crucial questions. "Are you a tribal person? What is your nation? What is your tribe? Would you say you are culturally or socially or politically native?" Harjo asked. Those without such connections cannot represent native opinions, she said. Indian support for the name "is really a classic case of internalized oppression," Harjo said. "People taking on what has been said about them, how they have been described, to such an extent that they don't even notice." Harjo declines to estimate what percentage of native people oppose the name. But she notes that the many organizations supporting her lawsuit include the Cherokee, Comanche, Oneida and Seminole tribes, as well as the National Congress of American Indians, the largest intertribal organization, which represents more than 250 groups with a combined enrollment of 1.2 million. 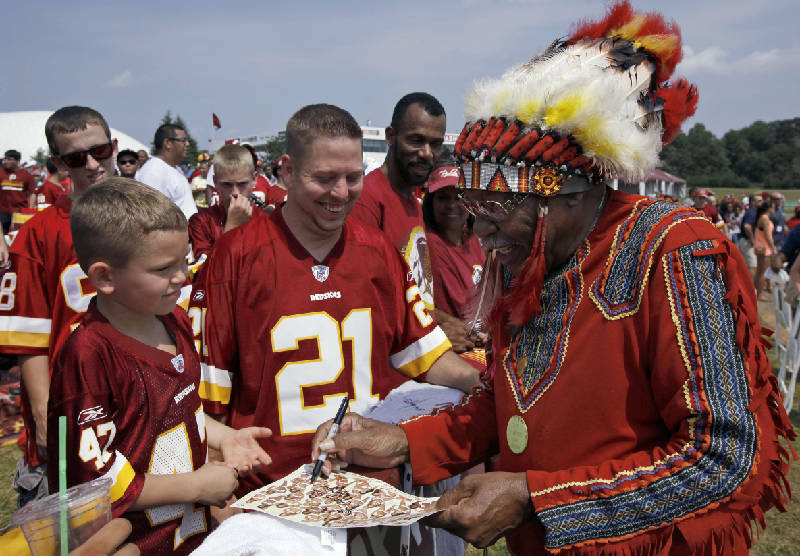 "The 'Redskins' trademark is disparaging to Native Americans and perpetuates a centuries-old stereotype of Native Americans as 'blood-thirsty savages,' 'noble warriors' and an ethnic group 'frozen in history,'" the National Congress said in a brief filed in the lawsuit. The Merriam-Webster dictionary says the term is "very offensive and should be avoided." But like another infamous racial epithet, the N-word, it has been redefined by some native people as a term of familiarity or endearment, often in abbreviated form, according to Meland, the Indian professor. "Of course, it is one thing for one 'skin to call another 'skin a 'skin, but it has entirely different meaning when a non-Indian uses it," Meland said in an email interview. It was a white man who applied it to this particular football team: Owner George Preston Marshall chose the name in 1932 partly to honor the head coach, William "Lone Star" Dietz, who was known as an Indian. "The Washington Redskins name has thus from its origin represented a positive meaning distinct from any disparagement that could be viewed in some other context," NFL Commissioner Roger Goodell wrote in June to 10 members of Congress who challenged the name. Marshall, however, had a reputation as a racist. He was the last NFL owner who refused to sign black players -- the federal government forced him to integrate in 1962 by threatening to cancel the lease on his stadium. When he died in 1969, his will created a Redskins Foundation but stipulated that it never support "the principle of racial integration in any form." And Dietz, the namesake Redskin, may not have even been a real Indian. Dietz served jail time for charges that he falsely registered for the draft as an Indian in order to avoid service. According to an investigation by the Indian Country Today newspaper, he stole the identity of a missing Oglala Sioux man. Now, 81 years into this jumbled identity tale, the saga seems to finally be coming to a head. The NFL's tone has shifted over the last few months, from defiance to conciliation. "If we are offending one person," Goodell, the NFL commissioner, said last month, "we need to be listening."